When #20 Wisconsin and #3 Ohio State tip off from the Kohl Center on Saturday afternoon 1st place and the inside track to the regular season conference title is on the line. Just two weeks ago the chances of this game meaning anything other than for pride seemed slim to none amongst the Badger faithful. But the Badgers come in putting a 6 game winning streak on the line against the Buckeyes 4 game winning streak. Lots has been made of what happened at the Kohl Center last season as Wisconsin took down the top ranked Buckeyes, but this is a new year and two completely different teams. It's also amazing how quickly some forget the absolute beat down that Ohio State put on Wisconsin to end the regular season last year, winning 93-68 in Columbus. Wisconsin comes in to this game also putting a 9 game winning streak at home over the Buckeyes on the line. Overall the series lead belongs to Ohio Sate though, at 82-65. Sure Jarred Sullinger and Jordan Taylor are major players on both teams, but overall they both have major changes to the roster and a lot of the key players in the 2012 matchup weren't major players at all in the 2011 matchups. The one common theme in this game is defense. Wisconsin and Ohio State are two of the best defensive teams in the country, but they get it done in completely different ways. Ohio State employs a fast paced zone style of defense, while the Badgers are in your face man to man all day every day. Wisconsin is 1st in the conference and country in team defense, allowing opponents to score just 49.5 points a game (which would be a D1 record). Ohio State isn't far behind, ranking 2nd in the Big Ten and 7th nationally while giving up only 55.6 points per game. But an ever better indicator of just how good these two teams are defensively is their scoring margins. Again they rank 1st and 2nd in conference, but it's Ohio State that comes out on top with a +21.7 margin with Wisconsin next at +15.1 a game. After getting a tough lesson in Grand Forks last weekend the young Badgers Hockey team returns home hoping to regain some momentum for the final stretch as they take on St. Cloud State this weekend at the Kohl Center. It's a vital series for both squads as St. Cloud State (10-14-4, 7-10-3, 17 points) sits just one point in front of the Badgers (12-12-2, 7-11-2, 16 points) in the WCHA standings and are also coming off of being swept last weekend, albeit by league leaders Minnesota. These teams are pretty familiar with each other and have already met once this season resulting in a loss (7-2) and a tie up in St. Cloud for Wisconsin. Overall Wisconsin leads the series between these two teams 43-30-9 and are 26-11-4 in games played in Madison. Wisconsin needs to prove it can overcome adversity after last weekend coming from behind to tie the games 4 times over the series and being unable to fully come back and have only won one game all year in which they were the first team to give up a goal. The biggest positive coming out of last weekend for Wisconsin was the increased production from guys other than Justin Schultz and Mark Zengerle. Don't get me wrong, they both had a hand in the comebacks, but it was the play of guys like Keegan Meuer and Michael Mersch that really propelled the Badgers. Meuer had goals in both games and is now 5th on the team in goals, while Mersch tailed twice in the Friday game and now sits tied for 2nd with 10 goals on the year. He's just 2 goals behind team leader Justin Schultz who has the chance to become the first ever Badgers defenseman to lead the team in scoring for a season. We weren't the only ones to notice the increased importance of guys like Meuer and Mersch. "So he is teaching in his own way," Coach Eaves said of Meuer. "He's leading in his own way, and it's something that we, as a coaching staff recognize. I mean, he basically played himself up into the top three centers this past weekend, one of our most effective players, because he played with a big heart in his chest." The player that is key for the Badgers defense to stop is junior forward and Pittsburgh Penguin draftee, Ben Hanowski. He had three goals over the 2 game series in early November between these two teams and is tied for 6th in goals in the WCHA at 15 on the year. He also leads the team with 30 points on the year. On the other hand St. Cloud State is coming off of a pair of one goal losses to Minnesota in a rare home and home series between the two in state foes last weekend. They've also dropped 6 of their past 7 games and have only won two games the 2nd half of the season so far. Jared Festler and Andrew Prochno are other Huskies that the Badgers defense must stop. Festler is the only other Huskies player with double digit goals, scoring 11 so far this season and has 22 points overall. Prochnow has 21 points, 17 of which have come from assists. As a team the Huskies score just 2.9 goals a game and give up just about the same at 2.93 goals a game. The Badgers will be facing a goaltender in Ryan Faragher who has started 22 of 28 games this season. He's got a 2.76 goals against average which is good for 10th in the WCHA. However his save percentage of .915 is very good, ranking him 7th in the conference. He should see the net as a starter in both of these games. Wisconsin will be countering with Joel Rumpel who's gotten better as the season goes along and finds himself having one heck of a 2nd half of the season. Overall he sports a 9-7-2 record in his freshman season. But in the 2nd half he's increased his numbers big time. His goals against average in the 2nd half is 2.00 compared to an overall average of 2.63 and was much better than that difference before the goal-fest that was last weekend. For the year his save percentage is .915 and has steadily increased this 2nd half thanks to 2 shutouts. The most interesting thing to watch in this series may be the penalty situation between these two teams. Wisconsin and St. Cloud State are the 12th and 11th penalty kill units in the WCHA but the biggest difference is that St. Cloud State doesn't give up many penalties, only averaging 11.8 penalty minutes a game. If Wisconsin can get the edge in penalties they should be able to use a power play unit that scores on 21.1% of it's chances to it's advantage and could be key to winning the series this weekend. Friday's game takes place at 7pmCT on BTN and Saturday the puck drops at 8pm and will air on WISC-TV (Charter Extra 87 around Wisconsin) wit a replay of the game on Wisconsin Channel (wpt.org online). Prediction: St. Cloud State has really crashed to earth in the 2nd half of this season and while the Badgers lost both games last weekend they felt good about the effort. I see Wisconsin taking both games this weekend to prove they aren't done in this race yet. Friday will be 3-2 Wisconsin and Saturday will be 4-1 Wisconsin. Anticipation, hope, shock, letdown, dismay, and joy - just a few of the emotions felt by college football fans and coaching staffs all across the country yesterday as National Signing Day unfolded. Wisconsin fans surely felt all those emotions to varying degrees and we were right here with you with some of those emotions. However, after taking about 24 hours to process exactly what went down yesterday it's safe to say that while this wasn't the biggest class in the world and losing Kyle Dodson did sting I'm happy with the class that we do have. It's also clear that Bret Bielema stirred the hornets nest to close out his press conference and that the media took a comment he made about recruiting in general as a case of sour grapes over losing Dodson to Ohio State, something that couldn't be further from the truth. But more on that later. For all of those complaining about the class let me ask you this: When was the last time Wisconsin was in the mix for some of the top prospects in the country and won out? That's exactly what happened with QB Bart Houston, OL Dan Voltz and LB Vince Biegel. Houston was one of the "Elite 11" an honor not to be taken lightly in the QB recruiting circles, Voltz was a top 5 offensive guards nationally and Biegel was widely regarded as one of the top 3-5 linebackers in the country. All had offers from all the country and chose the Badgers. 4-5 years ago, I don't know if any come here. Biegel is probably headed to BYU, Voltz is probably at Michigan or Ohio State and Houston wouldn't have even considered Wisconsin an option. That's how far we've come in the recruiting world under Bielema. There were some who expressed anger and disappointment on this day and most of it was directed at Kyle Dodson, the highly regarded offensive lineman out of Cleveland Heights, OH. He was a one time verbal commitment to the Badgers, but with Urban Meyer at Ohio State and the staff changes here at Wisconsin the home state Buckeyes won out. While I feel for those who held out hope, it's clear you weren't seeing the writing on the wall of his decommitment. I can't say I blame him for staying home, especially in a recruiting world were kids are going to schools more and more based on personal relationships with coaches than what the overall school has to offer and that's not totally a bad thing. He clearly had a great relationship with Bob Bostad and that gave the Badgers a leg up, but his leaving was probably the final nail in the coffin that Urban Meyer's hire started building. Welcome to MTB's Recruiting Central!! Here you'll find all the latest on the signings as they become official and we'll be adding profiles for all the players Wisconsin adds today right here in one spot for you! Thanks to all who joined in our chat earlier today, it was fun and informative as well. Our coverage wraped up with our 1st annual Badgers Power Hour - National Signing Day Special where we broke down all that happend with recruiting experts Kyle Heikkinen of Badger247, Ben Worgull of BadgerNation, and Jon McNamara of BadgerBlitz. We were also joined by Rivals Midwest Recruiting Analyst Josh Helmholdt, 247Sports National Writer Steve Wiltfong and Scout.com Midwest Football Recruiting Manager Allen Trieu to talk about their overall feelings on the Big Ten and Wisconsin from an outsiders perspective. Our final guest wwas be Kevin McGuire who is the editor for fellow Bloguin site the Nittany Lions Den and hosts the No2MinuteWarning podcast. It sure wasn't pretty, but in the end Wisconsin (18-5, 7-3 conf.) found a way to pull it out, winning 52-46 over Penn State (10-13, 2-8 conf.) to extend their winning streak to a conference best six straight games. It also vaulted the Badgers to 2nd place in the conference standings with a game against Big Ten leader Ohio State on the horizon. Jordan Taylor paced Wisconsin with 18 points, including hitting an absolutely clutch 3 pointer with 1:44 left in the game, as well as 6 straight free throws to push the Badgers to victory in a game that was much closer than the final score indicated. Taylor really put Wisconsin on his back, scoring 13 of the final 17 points for Bucky in the win. There's a saying out there "Those who can not remember the past are condemned to repeat it," and after the 1st half it sure looked like Wisconsin didn't remember what the last meeting between these two teams looked like. Give credit to a good defensive effort for the Nittany Lions, but Wisconsin was simply ice cold, going nearly 8 minutes between baskets as Penn State managed to double up the Badgers at 18-9 with just about 4 minutes left in the 1st half. Luckily Wisconsin found a way to come up with a few more points and were equal to the task on defense as they were only down 6 at the half, 17-23. Just how bad were things for Wisconsin? They shot a paltry 2-11 from beyond the arc and shot only 26.9% from the field in the 1st half. What helped to keep the Badgers in the game was a defense that didn't foul much, only allowing Penn State to attempt one free throw in the half. They also shot 25% from behind the 3 point line and leading scorer Tim Frazier was held quite, scoring only 4 points in the half. Views From the Editors Desk: Don't Be That Guy!! As we announced earlier today we've got a FULL DAY of coverage ahead tomorrow for what is turning into a more and more bizarre spectacle that is known as National Signing Day. Now, there's nothing wrong with "calling in sick" and spending the day pouring over the stats, videos, and names of the newest players to become part of the Badgers family. Heck, we're doing hours and hours of chatting and a full radio show dedicated to just that. However, there's been this increasing trend with the access that has come along with the advent of facebook and twitter and that's the crazed "SuperFan." You know, the guy that is sitting on his couch or at his desk in the basement scouring the Internet for any information on how to contact a player in high school to tell him how great his favorite school is. Every teams has "that guy" and Wisconsin is no different. Tomorrow can be a fun, exciting, and sometimes surprising day. But it can also lead to "that guy" becoming a belligerent a-hole, finding players accounts on twitter and facebook and harassing them because they didn't chose to come to school X or school A and saying the most foul and disgusting things. There's something wrong with a 45 year old man talking junk to a 17 year old kid and it's about time it stops! The advent of facebook and twitter has been great in getting to know the thoughts of potential recruits and a good way to keep up with what they are using to decide where they will be playing football at, but it's also become a place where nameless idiots have decided it's o.k. to harass and threaten kids and in some cases down right stalk them and it's getting more and more out of hand by the day. If you're going to be "that guy" then I've got a request for you. Find the nearest cement wall and start banging your head against it. You're not going to be hurting anything and it'll keep you occupied and away from your computer where you'd likely spew wretched stuff like talking about doing things to "your mom" or "I'll hunt you down" (believe it or not I've actually seen those exact words to some recruits on twitter). Let's all remember that these are guys and gals who have literally just begun driving and in some cases still have to have mom and dad sign on the dotted line with them because they aren't yet 18 years old. If you're "that guy" or know someone who is, it's time to STOP BEING THAT GUY!! You give all fans of your school a terrible name and if you think you have any shot at influencing a kids decision, well you're right, chances are you just chased him right into another school because you're AN IDIOT! If you know someone who fits that description it may be a time for a little "intervention" or at least let that person know how much of a douche-bag he/she is being an help us stop the harassment of young athletes. So, tomororw and for the rest of the year please do us all a favor and Don't Be That Guy! We're Your National Signing Day Headquarters!! 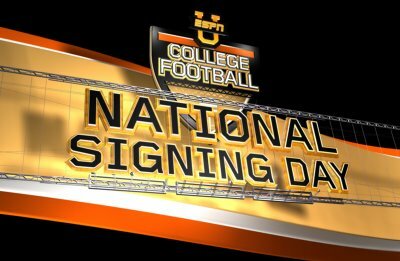 Tomorrow is an unofficial holiday for nearly all college football fanatics and of course if you're reading this you probably are amongst those ranks as are we here at MadTown Badgers because it's NATIONAL SIGNING DAY! We wanted to make you aware of what we've got planned for such a momentus occasion, as it's our 1st NATIONAL SIGNING DAY in our staff's history together. So be sure you come back here tomorrow as we bring you a full day of coverage. We'll be starting with a live chat and updates on recruits making things official throughout the day, beginning at 7am CT tomorrow. So make sure you tune in and join us as we discuss the class that's forming as well as take a look at the other sports and their signings as they become available as well. We'll also be breaking down the thoughts of ESPN and BTN analysts on their recruiting specials throughout the day! Things will end early in the afternoon (2pmCT) and we'll be live tweeting the Bret Bielema press conference at 3pm CT on our Twitter account. Lastly, we'll be wrapping up the day with Badgers Power Hour: National Signing Day Special. All the action starts at 8pmCT on blogtalkradio. We'll be chatting with a group of people from BadgerBlitz (Rivals) and Badger247 as we dive into the nuts and bolts of the Badgers football recruiting class. Also joining us will be Rivals Midwest Recruiting Analyst Josh Helmholdt and Scout Midwest Recruiting Manager Allen Trieu (he'll also be appearing on the BTN coverage earlier in the day). As always we'll be taking your phone calls and with the guests coming on we'll be taking your questions about the class or individual players, so make sure you call in at 714-242-5166. But if you thought things just kicked off tomorrow for the Badgers you'd be wrong. 3 members of the recruiting class are already on campus and in class and the training rooms in OG Dan Voltz, CB Hugs Etienne, and RB Vonte Jackson. Mike Lucas on uwbadgers.com has a nice write up on the guys that you shoud check out. Etienne's story is particularly interesting and he just may be the one guy that really flys under the radar in this recruiting class. Don't forget to follow us on Twitter and 'like' us on Facebook. As we bring you exclusive content on both social media networks. Also, any questions or feedback can be directed to us by hitting the contact us at the top of the page. #20 Wisconsin (17-5, 6-3 Big Ten) is looking to extend their 5 game winning streak as they hit the road to face Penn State (10-12, 2-7 Big Ten) at the Bryce Jordan Center. The game tips off at 7:00 PM CT and Big Ten Network has the coverage. Though they have a bad record, Penn State isn’t a terrible team. They’ve shown they’re somewhat of a threat at home getting wins over Illinois and Purdue. Penn State is the only team in the Big Ten conference below 500. on the year. In a year where the Big Ten is stacked, Penn State finds themselves at the bottom of the conference. On the other hand, Wisconsin finds themselves 3rd in the conference right behind Ohio State and Michigan State. After their 1-3 start in Big Ten play, the Badgers have won 5 in a row. They come into this game with lots of momentum, after beating #16 Indiana at the Kohl Center last Thursday. Last year the Badgers and Nittany Lions split the regular season series, both wining the matchups at home. Penn State got the last laugh though, as they knocked off the Badgers 36-33 in the Big Ten Tournament. But the Nittany Lions star point guard Talor Battle graduated last year, and they’ve had a tough time replacing him this season. Badgers Basketball is starting to climb back up in the polls as they now rank #19 in the AP poll and #20 in the coaches poll released earlier today. Could we see Bucky back in the Top 15where they started the season? We'll know a lot more after this weeks games and very well could see them back should they knock off Ohio State this weekend. Keep yourself informed by visiting us here and of course following us on Twitter and Facebook. Different night, same results for the Badgers as North Dakota (15-10-2, 11-9-0 WCHA) closed out the weekend series with a 4-2 victory over Wisconsin ((12-12-2, 7-11-2 WCHA). The win completed the weekend sweep for UND as they avenged an early season sweep by the Badgers in Madison. It was a story of Wisconsin having to play from behind for the 2nd straight night and not being able to take a lead before UND slammed the door shut on any comeback attempt. The game started off vastly different from Friday night as both teams were far more aggressive in checking and it had a feel of playoff hockey as both teams knew what was at stake. Both teams seemed to be playing tight and headed for a scoreless 1st period, but the final few minutes changed all that. Star Wisconsin defenseman Justin Schultz took the Badgers 1st penalty of the game at the 18:17 mark of the period and the Badgers were forced to play a man down for the remainder of the period. However, that was the opening UND needed as just 55 seconds from intermission forward Danny Kristo broke the deadlock on a very nice give and go from Brock Nelson to give North Dakota the 1-0 advantage. It looked like they'd go into the break with the lead, but just like Friday night the Badgers fought hard and just 10 seconds later Keegan Meuer would take advantage of a nice rebound off the boards behind UND goalie Brad Eidsness and some awful officiating to slot home a riffled shot and tie the game back up 1-1. Meuer raced up ice off the faceoff saw the puck head behind the UND net and he should've been called for a tripping penalty as he clearly stuck his stick between the legs of the North Dakota defender but the official, who was right in the line of the offense, never called it and Meuer used the advantage to slot home a beautiful wrist shot from the point. It was his 2nd goal in the series and showed Wisconsin wasn't about to give up without a fight. Things felt just like Friday night going into intermission and they'd continue to feel that way as just over 2 minutes into the 2nd period UND would retake the lead on a blast from beyond the blue line by Andrew MacWilliam that sneaked past the shoulder of Joel Rumpel for a 2-1 UND advantage. To prove things were even more like Friday night the Badgers would come back once again, the fourth time in the series. With just 9:27 left in the 2nd period captain John Ramage found himself open in front of the net after Brendan Woods snuffed out a UND clearing attempt and put the puck in on a nice backhand shot. With the score tied at 2-2 North Dakota really took control of the game as they out hit and out worked Wisconsin. That work paid off as just 5 minutes after Ramage's 2nd goal of the season Michael Parks netted the game winner, putting UND up 3-2. North Dakota iced the game away with a 4th goal courtesy of Brock Nelson at the 6:30 mark fo the 3rd period and Wisconsin just couldn't solve the UND defense for the rest of the night. Things really could've been worse for Wisconsin, but freshman netminder Joel Rumpel played a very good game, stopping 37 of the 41 shots he faced on the night. All you need to know about why Wisconsin couldn't come all the way back lies in these numbers: 41-22. That is the shots on goal for North Dakota vs. Wisconsin. You can't give up that many opportunities and have so few of your own if you want to attempt a complete comeback. The sweep puts UND in the drivers seat for a home playoff series as they moved up to a tie for 4th, sitting on 22 points. Wisconsin cost themselves dearly with the two losses and still sit in 9th place on 16 points. They are now 5 points out of that 6th and final home spot for the playoffs, currently held by Nebraska-Omaha on 21 points. Up next for the Badgers is a weekend tilt with St. Cloud State at the Kohl Center. The Huskies are currently 8th place, just one point ahead of Wisconsin in the WCHA standings after being swept by league leading Minnesota this weekend.